I started making these little bunnies last spring as pins. They were kind of a booth filler for me, and I really loved making them and seeing them all together in a bowl, so cute! Well, I was thumbing through a craft book and saw a pillow with a pocket and a little lamb stuck in it.. and I knew I had to make a pillow for my bunnies!!! This is so easy to do! I hope you have fun making it! *Please note the usage at the bottom of this tutorial. There are restrictions. Thank you! 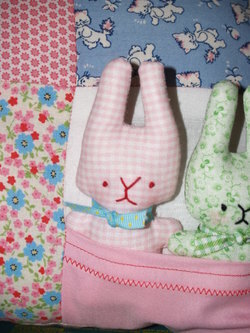 For this project, you will need 8 different fabrics, 5 for the front, one for the back, and 2 for the bunnies. 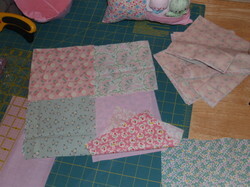 For the front of the pillow, cut 5 6" squares. 1 square will be the front of the pocket. Lay your squares out to the design that you like. Here I used a plain pink for the background of the pocket square, and above, I used white for the background. Once you have your design laid out, it's time to sew! First, fold the square that will be the front of your pocket in half. Sew along the fold. You can use a decorative stitch here for added cuteness! Place this pocket front onto the background square and baste it in place. Now you have 4 squares instead of 5 for the front, 1 of them being the pocket square! Sew these squares together into a basic 4 patch design. I like the pocket square to be on the bottom right, but you can place it anywhere! Be creative! 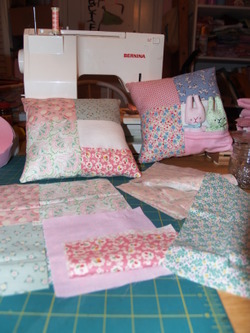 For pillows, I usually use a 1/2" seam allowance for durability and ease. Now that the front is finished, you'll need a back! Cut an 11" square. Place the front and back right sides together and pin. 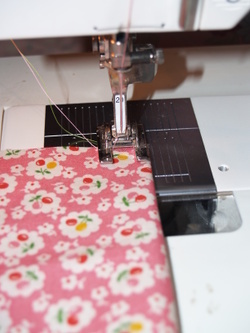 Sew around the edges of the pillow leaving a small opening on the side for Turning and stuffing. Before you turn the pillow right side out, clip the corners so they will look sharper! Time to make BUNNIES! This is the best part!!! 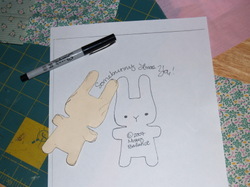 Download somebunny.pdf Click on that link and print the pattern onto card stock or something stiff so you can cut it out and trace around it with ease! The pic is of the pattern I printed and the one I've been using since last year... it's got a few lines on it huh! LOL! This picture kind of shows two steps in one. Take the fabric you are using for your bunnies and place it right sides together! 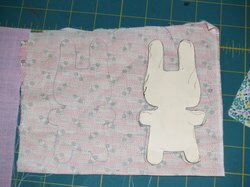 Trace the bunny onto your fabric with pencil. Sew directly on the traced line, and sew ALL THE WAY AROUND! Clip the bunny out allowing only a tiny seam allowance. This can be tricky... if you make the seam allowance too big, your bunny will be lumpy, too small, and you will pop seams open when you are stuffing. About 1/4" works well. If you look closely, you can see that these bunnies have slits in their backs. This was for turning and stuffing. Once the bunny is clipped out, carefully cut a slit in his back for turning and stuffing. Make sure you are only cutting through ONE layer. Turn and stuff your bunnies, (hopefully you've made two even though I only told you how to make one! LOL!) and then hand sew the slit shut. For your bunnies faces, just make two french knots for their eyes, and the simple Y pattern for their mouths and noses :) If you don't know how to make french knots, you can use tiny buttons or beads, or make a few tiny stitches... that works just as well! I didn't know how to make french knots for the LONGEST time, so I was queen of taking a few tiny stitches that looked like a french knot... lol! SO did you do it? Did you make one? I wanna see! Email me or post a pic! This would be just such a sweet spring or Valentine's day gift for the little ones in your life! Okay... so that was very fun! 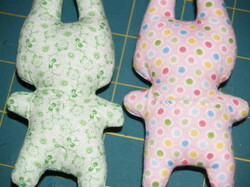 But let's not forget what prompted this project to begin with... those cute little bunnies! Here is a list of other (not for profit!) things you can do with them too! Do you have an idea? Please share! Make a little bunny and add it to your teddy bears arms... she needs a friend! *Usage: You may make these for yourself or your friends, but not for profit. If you would like to sell the things you make from this pattern, please buy the rights to do so for only $10. You can paypal me at MissyBallance@aol.com and then you'll be happy and so will I :) It just keeps everything on the level! Thanks so much!!!! I loved your tutorial on the pillows. I was looking for a cute simple project to make. I made 4 pillows and will be sent out this year in the Operation Christmas Child Shoeboxes through Samaritan's Purse. That is so cute! I'm going to do any number of these for my friend and I then plan to put books on the possible cuteness hidden inside hollowed out. I love these bunnies! I made one for my friend and we were in the hospital in less than a minute after because she fainted they were so cute. Thanks so much for this great idea. And most of all your free pattern. 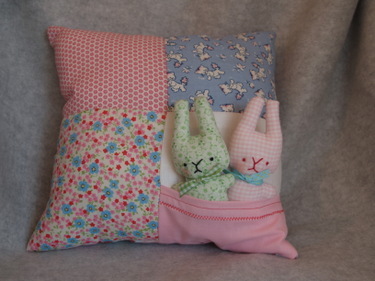 I made this bunny for our own cushion collections, and that thanks to you. If you have time, kindly visit my blog. You probably wouldn't understand what I wrote, cos I mix it with Indonesian language. But, I just want to let you know that we have that cushion collections because I found your blog. Thanks so much. ohh this is tempting I do have a bunch of quilting fabric that would be perfect, plus like you said toddlers do love to stuff pockets! This is so cute! I wish I knew how to sew! Do you do lessons Missy? I really like that white with green floral fabric. Where did you get it? These ARE really cute and look easy. I put in a search for free/near free bunnie patterns and yours popped up. We're having a fundraiser and this is just the ticket. Very cute pillow.. I've made the bunnies for christmas gift.. Thanks for the tutorial..
Aw! These bunny Pillows are cute! I saw the bunnies on someone else's blog and decided to make them. I wanted to post them onto the internet on warriorofthewind.deviantart.com, but i wanted to track the pattern down to the original place posted first. When I looked at the Some Bunny Loves You pattern, I was wondering if this was a card. Guess I was wrong. I think I'll make a Bunny Pillow for bunny storage. I put them on my bed, but sometimes they fall through the small crack in between the wall and the bed, and then I have to go under the bed and get them. Thanks for posting this cute project! Way to cute :) Me & my two girls are doing up some today ! They are picking out fabric as I type this LOL, I will post pics to my blog when we are done. Thanks so much for the pattern!!! Awesome!!! I posted this on my blog and linked it to your site! I found your link on CRAFT and love it...I so want to make those for my girls! I made one for me and my friend! OMG - this is a MUST MAKE!! Thank you so much! Thank you so much for posting this tutorial! I just finished one for my niece for Christmas. I've gotten rave reviews from everyone that I've shown it to (and linked back here for proper props to you. :) Thanks again! I've been working on these for the last two nights. They are so cute! The bunnies took me forever to turn and stuff - much longer than I thought they would. So I've never done embroidery before, and I'm panicking because maybe I should have done the face before I stuffed them? EEK! So cute! I love it! I am a bunny owner and have a bunny-themed room. It will be a great addition to my collection! ooooh my goodness those are the cutest! Loooooooove this!!! too bad I cannot sew!! My goodness!! I wish I wish!! Love it to bits though!! so so sweet and vintagey!! you clever stylish doll you! !